For those following me on Instagram, you were privy to photos of the dinner menu I put together for my fella's birthday. Over the last few months, we have developed a bit of a romantic relationship with all sorts of Mexican food, and so I carried that love into his birthday dinner. I couldn't resist following up last week's Dia de Muertos post with the full details (scroll down to the end for a Horchata recipe). After having a beautiful sugar skull clock custom made for him, I knew a subtle Dia de Muertos themed evening was pretty much the greatest idea ever. Nothing like a good gift to set me up for a themed adventure! I ordered a cute little party banner from Kiwi Tini on Etsy, draped a cute scarf and fabric over my table, put a fun Mexican dance/salsa mix on Songza and voila! My kitchen oozed with colourful, spicy atmosphere. After a few requests for recipes, I thought I'd be a doll and put all the links in one place. Below are the menu items and the links to the websites/blogs I found them on. For once in my life, I followed recipes pretty closely and so there are limited substitutions to report!! The one exception is the Horchata rice pudding--see notes below for details (and my take on a Horchata recipe). The entire menu was amazing. Gorditas are my new obsession, and I suspect my new dietary staple. Despite all the yumminess, I highly recommend the Horchata Rice Pudding recipe from Better Homes and Gardens... 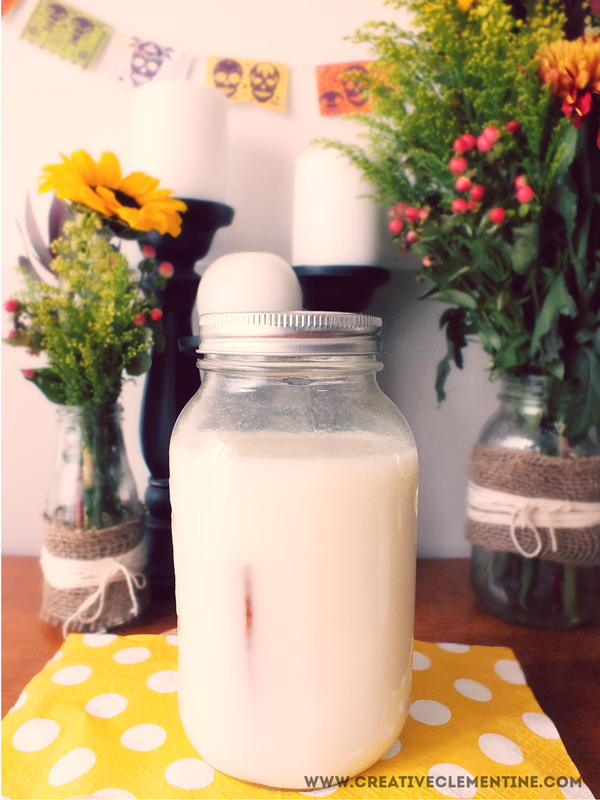 I made mine dairy-free using homemade sweetened condensed coconut milk and an easy Horchata "hack" that I am absolutely in love with. Scroll down for the recipe! 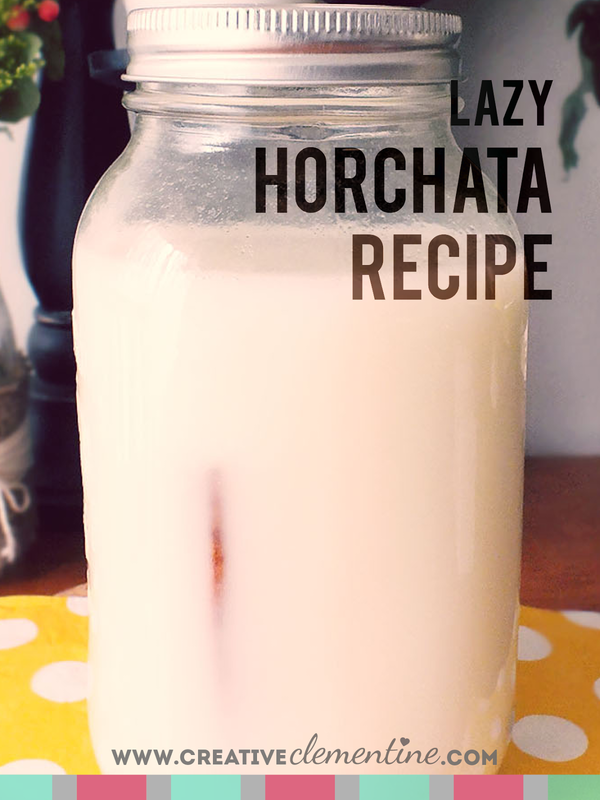 After researching what Horchata is, and the best ways to make it (this post from Noshon.it is amazingly detailed), I decided on a short cut that would do in a pinch. I used the ratio from the Nosh post to come up with a quick solution that required only a mason jar. In a 1L mason jar, I mixed 3 parts almond milk to one part rice milk, and added two cinnamon sticks. I then closed it up, gave it a shake, and refrigerated it overnight. In the morning, I had a delicious mild Horchata that was the perfect base for a spiced rice pudding. Add almond milk, rice milk, and cinnamon sticks to mason jar. Close the jar and shake gently. Refrigerate at least overnight, or up to two or three days. Serve cold with ice, or use in recipes like rice pudding. I've never had Horchata and always wanted to try it. Thanks for sharing your recipe! Found you on the Dwell Beautiful link up! Beautiful photos, and a wonderful recipe! My name is Katie and I host Fall Into the Holidays, now open. All entries get pinned. I would love to have you link up! This turned out so cute! I love how you made out the menu!